You can’t teach old dogs new tricks because unlearning is like breaking concrete with a toothpick. We want change, but failure to unlearn keeps us the same. Action-oriented leaders unlearn slowly. The challenge after doing something that works is staying open. It’s easier to keep doing the same thing than to embrace new ways of thinking. The great challenge of unlearning is letting go of old ways of thinking about ourselves, others, and the way things get done. Defend rather than engage in conversation. Blame as a defense against taking responsibility. Find fault rather than seek solutions. Trust in authority rather than relationship. Believe that accountability concerns power to punish rather than shared responsibilities. You can’t learn if you don’t unlearn. Unlearning is listening to things that conflict with current ways of thinking. Unlearning is moving away from previous learning. 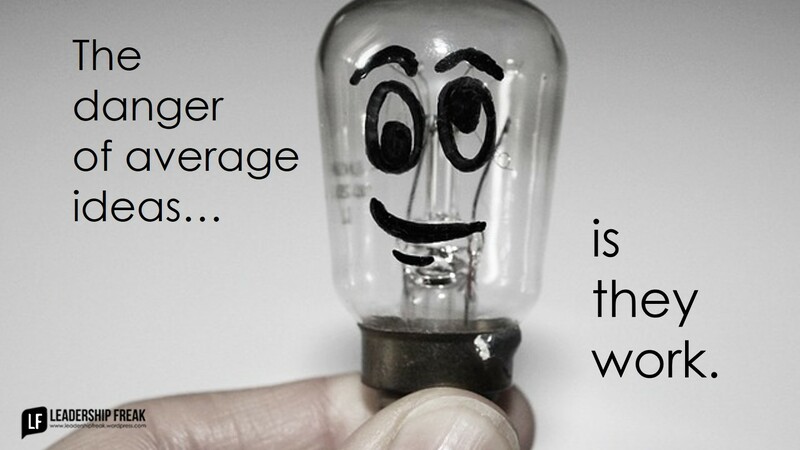 The danger of average ideas is they work. You’re getting things done with current methods. The challenge of unlearning and relearning is trying on untested behaviors. Focus on problem-solving rather than building a preferred future. It takes more courage to work to create something new than to fix something old. Tell less. Ask more. Curiosity is today’s untapped leadership skill. Ignite, monitor, and manage energy, more than processes and procedures. Focus on extroverts minimizes the potential of introverts. You are responsible for the world you live in, not others. Discussing what we expect from each other rather than demanding. Turning toward awkward conversations rather than away. Unlearn and relearning are the path to growth and fulfillment. Where might leaders need to engage in unlearning? What have you unlearned and relearned? Thanks Joe. Sorry the Pickle Pledge image didn’t display. If readers would like to take a look, it’s on amazon. Best wishes with your new book. Per Frederic M. Hudson, the founder of the Hudson Institute in Santa Barbara, California, and as part of his book introduction and his “Wake-Up Call” , he shares the benefit’s of some simple wisdom. Thanks Paul. Love the quote. I feel like learning and growth go hand in hand. Growth in business and leadership begins with learning, unlearning, and relearning. LOVE this article! This is so true and needs to be the foundational starting point to help people who want to grow their development. Many people claim they want to learn more, but they aren’t willing to unlearn what they already know and as a result, never realize the full extent of results that they could if they would “unlearn” some things. I’m going to go see what I can unlearn today! Thanks Dan!! Thanks, Dan. This is one of the most helpful posts I have seen. What great power there is in unlearning. I have seen those I admire most do this. Thanks Donna. A good word is an encouragement! Nice Article. Caught my eye and gave food to my thoughts. It ain’t easy though. I have been unemployed from past year and I have been trying to learn new things from quite sometime. I definitely want to go back to what I know because that is easy and comfortable, however for some reasons I cant. I must unlearn and then, Learn. Thanks Pooh. I respect that you told a bit of your story. I wish you success in your search. I’ve learned a lot over the past year in helping my company in a culture building initiative. I can see in some ways that ‘unlearning’ something that comes natural is similar to breaking a bad habit. There are scientific components deeply rooted in the brain that are associated with ‘unlearning’ or ‘breaking bad habits and replacing them with good habits’ as explained by Charles Duhigg in his book “The Power of Habit”. The unlearning process can be quite difficult but it can be done. Dan, this is a great site to help reinforce those things I have learned, as well as new things I’ve not thought about. Thanks for the daily reminders. Thanks Randy. It’s great that you mention Duhigg’s book. I really got a lot out of it. I hadn’t thought of his book in this context. Great connection. Correlating issues with unlearning to “old dogs” might not provide the best analogy. It is true, that unlearning is challenging. It is also true, though, that the need to unlearn before learning new things may happen at any age. “Old dogs” might be more agile at unlearning because they’ve had to do this time and again. Thanks jl. Good point! Thanks for jumping in. Watch out for that gap between when the old habit is un-learned and the new one is fully bedded in – that’s a big hole you can fall into. Thanks Mitch. Good call. I think the learning of new habits is a 3 steps forward 2 steps back process. It’s easy to declare early victory.